Cultural Ambassador Wilt “Tallpree” Cambridge and LIME General Manager Angus Steele. 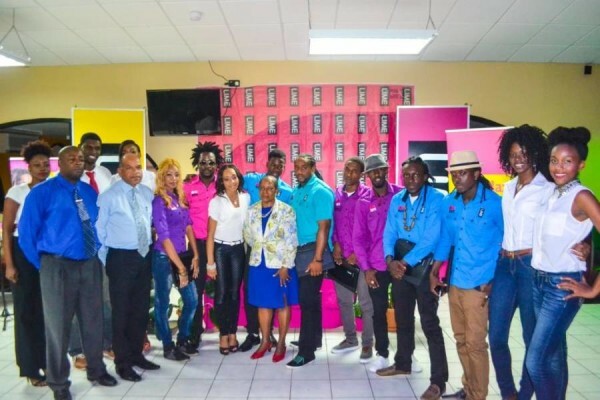 Telecommunications giant LIME, continues to support music and culture by signing six artistes for Spicemas 2014. 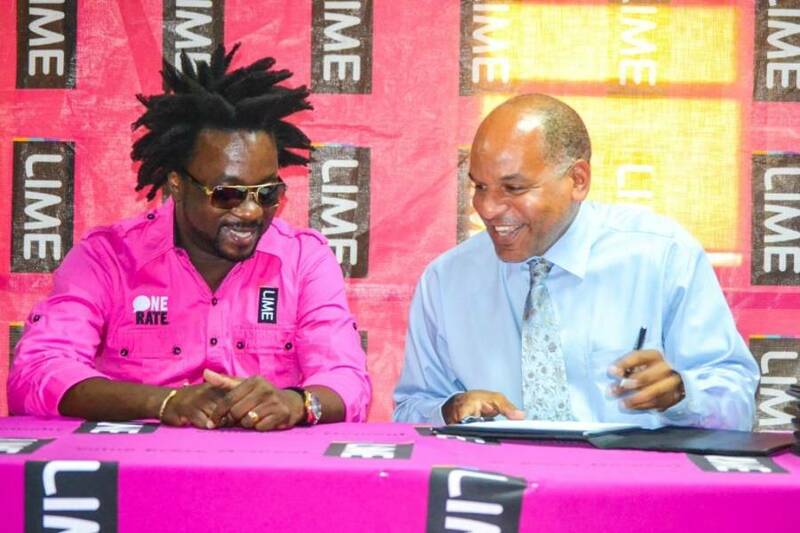 On Tuesday 17 June, LIME signed 6 local entertainers as LIME Artistes for the period 2014-2015. The energetic duo Dingaan Henry & Nyelon Henry “Lil Natty and Thunda”, female songstress Laura “Laura Lisa” Richardson, Cultural Ambassador Wilt “Tallpree” Cambridge, the singing brothers Kellon and Kelson Ogiste “Luni Spark and Electrify”, former Soca Monarch Kelvin “Otis” Celestine and the newest member to the LIME family, Jevaugh “Lil Vaughn” John, all received individual one year contracts as LIME Artistes. Speaking at the signing ceremony, Minister of Culture, Hon Brenda Hood, commended the company for their continuous support to Grenada’s culture through their contribution to Spicemas. Minister Hood encouraged LIME to extend their good work into the future. Chairman of the Spicemas Corporation, Alistair Bain thanked LIME for investing in Grenadian entertainment. He said LIME’s involvement in Spicemas through their sponsorship to various Steelpan orchestras, Monday Night Mas, artistes, among other sponsorships demonstrates the company’s commitment to the development of the Carnival product. Subsequent to signing the artistes, LIME’s General Manager Angus Steele, encouraged other businesses to also support local talent. According to Steele, LIME’s support to the artistes over the years adheres to the company’s promise to contribute to the development of Grenada, Carriacou and Petite Martinique. He stressed that the company supports their artistes assiduously, apart from their monetary contribution. LIME supports their artistes through production assistance for their music, support towards individual events/launches, and the overall promotion of their music among other areas. As the title sponsor of the LIME Kingman Calypso Tent, Steele also pledged LIME’s support to Calypso in Grenada. The tent, spearheaded by Calypso legend Edson “Ajamu” Mitchell, aims to revive the calypso culture on the island and LIME was eager to join the project as the title sponsor. Steele also announced LIME’s support to three additional artistes, and whilst these artistes were not signed they will also receive continuous support from the company. The event was also used as an opportunity to introduce LIME’s newest Brand Ambassadors. The company recently hired five young individuals – Jarryd Holdip, Tremaine Ross, Adonna Campbell, Aria Francis, Solange Thomas and Rehanna Warren – as Brand ambassadors for the period 2014-2015. The ambassadors will be used to represent the company for the next year. The contracts do not prevent the artistes from performing on other stages, but restrict them from wearing competing brands or paraphernalia, endorse or promote other brands. Thanking LIME on behalf of the artistes was “Electrify” from the duo Luni Spark and Electrify. Electrify highlighted the fact that entertainers do not receive pensions, and conveyed his gratitude for being signed for yet another year, and the importance of LIME’s assistance to all signed artistes.